Built on a curve, the Deadwood Bridge features deliberately slanted floorboards designed to improve motorist safety. 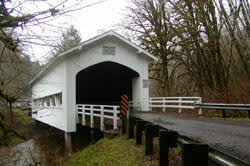 This unique bridge is part of a coastal range triad of covered bridges. Current Access - Vehicles up to 10 tons, maximum height 10&apos;7"
Deadwood Bridge was built by Lane County&apos;s bridge builder, Miller Sorenson in 1932 for $4,814. The bridge was built on a curve in the road so to make entering the bridge safer, flooring was installed on a slant. It has a long window all along the north side. In the 70s the covered bridge was bypassed with a concrete bridge just half a mile away that incorporated a more direct route. Functionally obsolete except as a wayside detour, Deadwood Bridge was neglected. Without maintenance over time the bridge became extremely dilapidated. 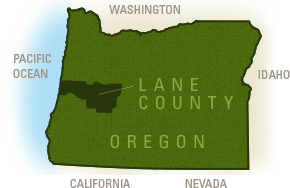 In 1986, Lane County overhauled the Deadwood Bridge by replacing the siding, flooring and portals. The bracing, roof and approaches were also repaired. Its original semi-elliptical portals were changed to Tuder arch during restoration. 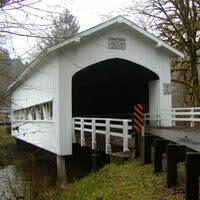 A Florence, OR covered bridge across Deadwood Creek spanning 105 feet (32 m). In 1932 it was built for the state's secondary road system for the cost of $4,814. Flooring was purposely installed slanted to improve safety for traffic rounding the corner onto the bridge. After a concrete bridge bypass was built in 1970s, Deadwood fell into disrepair. It was rehabilitated it in 1986 and re-opened to traffic. DIRECTIONS: Hwy 126 to Hwy 36 NE, 12 miles (19.31 km) to Deadwood. Turn north on Lower Deadwood Rd. Go approx 5 miles (8 km), turn right on Deadwood Loop Rd.